I paid my last visit to the Ardabil carpet yesterday which was a long Labor day holiday weekend. Los Angeles County Museum of Art, LACMA was very crowded. It was hot here in Los Angeles but I knew where I was heading. I went to the place in which the Ardabil carpet was on display. This was my fifth and last visit to this magnificent carpet. I am so happy and so lucky that I could visit this carpet several times. Each time, I took few pictures and each time the security guards approached me and asked me not to take pictures! 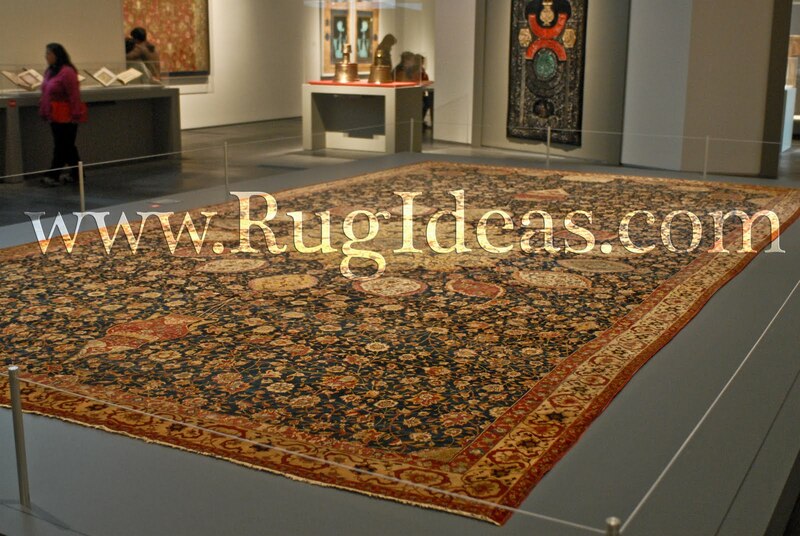 The famous Ardabil carpet will be on display until September 5, 2011 in LACMA Los Angeles County Museum of Art. I encourage everyone who can to visit this magnificent carpet before it is removed from the display and put is rest in a tube in vacuum in the treasure basement of the museum for another few years. I have visited this rug 4 times this past few weeks and each time I enjoyed seeing it even more. 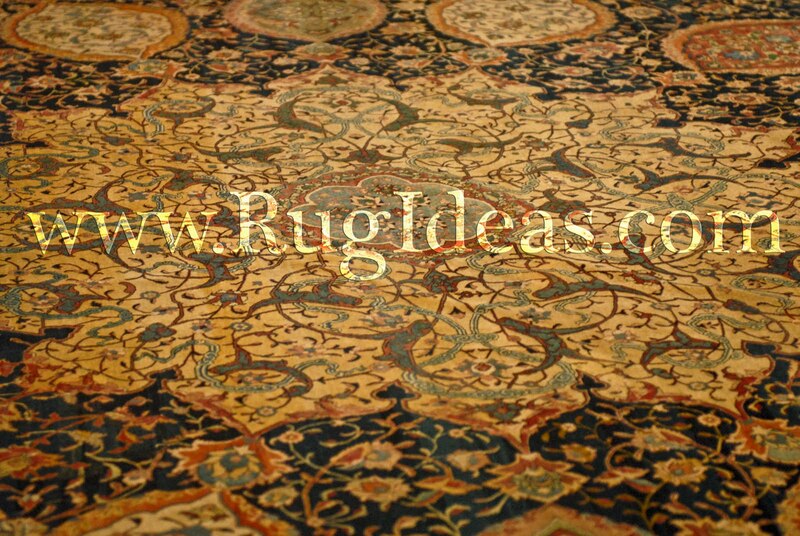 It is strange because every time I go to visit the Ardabil carpet, I would like to take pictures. Usually the security guards say you cannot use flash. This time, the guard who was very strict said you cannot take pictures at all! 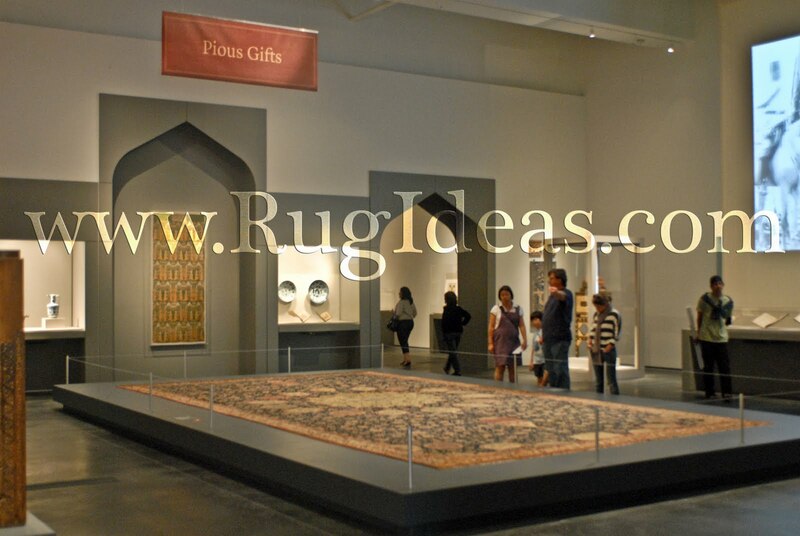 The great Ardabil carpet is on display as a part of Gift of the Sultan exhibition in Los Angeles County Museum of Art LACMA. I have visited this beautiful carpet several times in the past few weeks. In my earlier visits, the security guards were easy people and did not prevent taking pictures without flash. This last time, the security guard was a tough guy and did not let me take pictures without flash. I could take limited pictures whenever he was busy with something. But my camera made a noise each time I took pictures and this was making him upset. 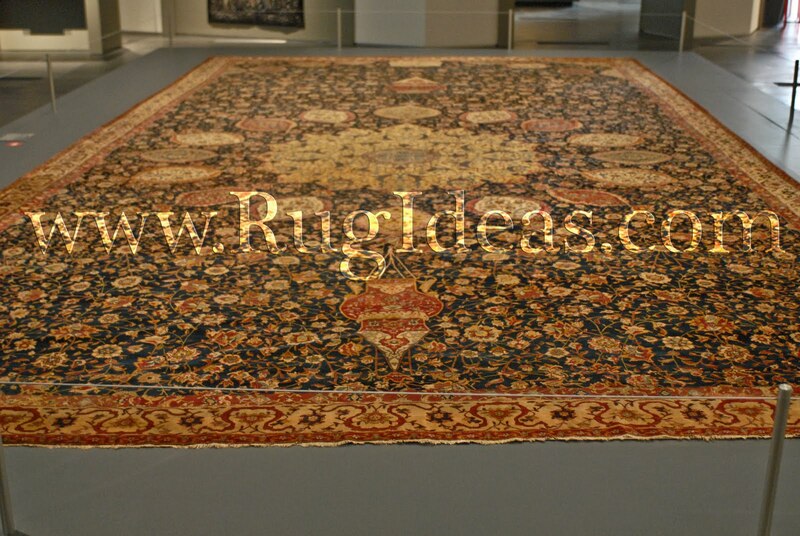 Anyway I am posting these exclusive pictures of the Ardabil carpet here. 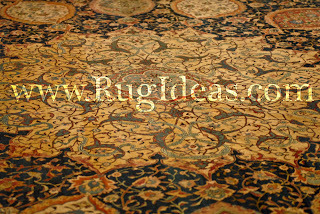 Since the Los Angeles Ardabil Carpet is one display every few years for a limited time, I like to take as many pictures/videos of this beautiful rug as I can and post them here on this blog. In my second trip this week to LACMA (Los Angeles County Museum of Art) which has the Ardabil Carpet on display now, I took these pictures. I like to share them with you. 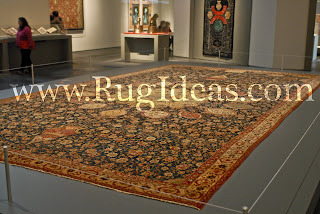 I went to LACMA Los Angeles County Museum of Art again for the second time in four days to see the Ardabil carpet and to take some more pictures. This time, the Ardabil Carpet is on display as part of the "Gift of the Sultan" exhibition. 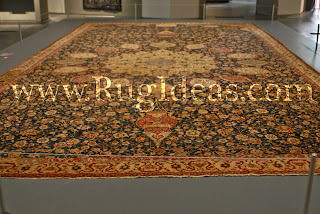 This is the oldest dated Persian carpet with the signature of the weaver. Other than thy threshold I have not refuge in this world. My head has no resting place other than this doorway. I went to LACMA last night and visited my love, the Ardabil Carpet. What a magnificent carpet. The more I watched it, the more I fell in love with it. I wish this rug could talk to tell so many stories. Before it is removed from the floor to put at rest again, I will visit it again and again. 1655 South La Cienega Blvd. Dr. Thompson has recently retired as May Beattie Fellow in Carpet Studies at the Ashmolean Museum of Art and Archaeology and the Khalili Research Center, at the University of Oxford. He continues to teach courses at the School of Oriental and African Studies, London, and at the Victoria and Albert Museum. 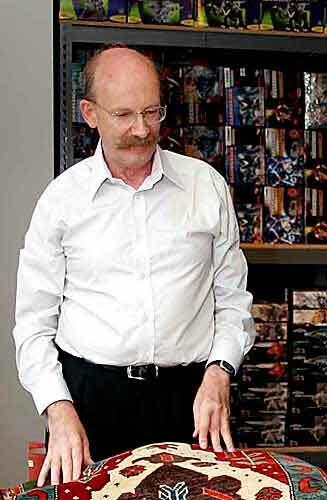 Dr. Jon Thompson is in Los Angeles to deliver a lecture on the Ardabil Carpet on Sat. Dec. 5, 2009 at 2:00 pm in Los Angeles County of Art Museum, LACMA. Thompson, Jon, ‘The Use of Purpura patula pansa on the Pacific Coast of Mexico’, Dyes in History and archaeology, no. 13, Royal Museum of Scotland, Edinburgh, December 1994, pp. 3–6. Thompson, Jon and Hero Granger-Taylor, ‘The Persian Zilu Loom of Meybod’, CIETA Bulletin 73, 1995-1996, pp. 27–53. Tapper, Richard, and Jon Thompson, co-editors and authors, The Nomadic Peoples of Iran, Azimuth Editions, London, 2002. Thompson, Jon, ‘Looms Carpets and Talims’, in Technology, Tradition and Survival, edited by Richard Tapper and Keith McLachlan, Frank Cass, London, 2003, pp. 205–216. 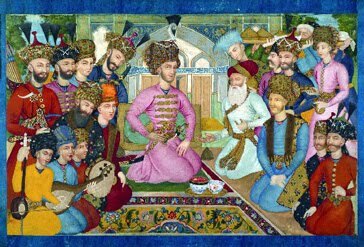 Thompson, Jon and Sheila Canby, co-editors and authors Hunt for Paradise, Court Arts of Safavid Iran 1501-1576, Asia Society, New York, 2003. Thompson, Jon, Silk 13th to 18th Centuries: Treasures from the Museum of Islamic Art Qatar, National Council for Culture Art and Heritage, Doha, 2004. Thompson Jon, Milestones in the History of Carpets, Moshe Tabibnia, Milan 2006. Thompson, Jon, Timbuktu to Tibet, Exotic Rugs & Textiles from New York Collectors, New York, 2008.